Wearing a mouthguard while you’re playing sports is important to protect your teeth and avoid dental injuries. When you have invested in a sports mouth guard from your Victoria dentist, Academy Dental, we’ll take you through the process of how to properly take care of your gear to ensure it stays protective and effective for a long time. To make sure your mouthguard is providing the protection you need, here are some tips to follow for mouthguard maintenance! First things first – make sure you get the right mouthguard for your needs. You can find specialized mouthguards that are designed for different levels of protection depending on the sport or activity you’ll be wearing it for. They are also designed based on which areas of the mouth need the most protection, whether it’s the front of the teeth or under the molars. Come for a consultation at your Victoria dentist, Academy Dental, to get fitted for a mouthguard that’s right for you! Many athletes believe that chewing gum during athletics increases brain activity, as the act of chewing improves various bodily functions. However, chewing on your mouthguard can cause damage to your mouthguard, and decrease its protective qualities. 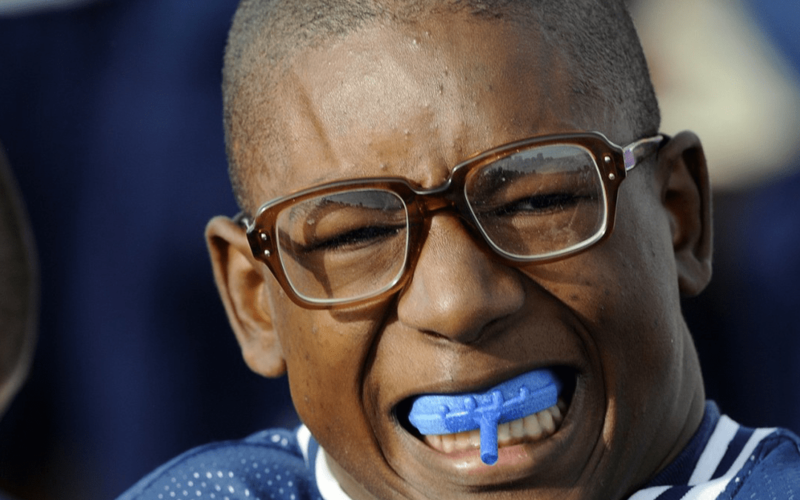 Not only can chewing cause your mouthguard to be less effective, but it can also make your mouthguard less comfortable, because chewing creates rips and tears. These tears allow bacteria to get trapped in the mouthguard, which you don’t want! No matter what type of mouthguard you have, it should be stored in a cool, dry place. It’s best to avoid heat and moisture, which can cause damage to your mouthguard and deform the protective material. Finally, be sure to keep your guard in a clean protective case when you’re not using it. For more information about how to take proper care of your mouthguard, come visit us at one of Academy Dental‘s convenient locations in Victoria.